Settings are especially relevant in the context of the alerting and response system because certain Settings define the criteria of when a Condition is considered to be met. This includes Runtime Threshold Settings. Other Settings, known as Source Settings define the events that are collected by SentryOne. Source Settings define minimum duration thresholds for the collection of events taking place in the monitored environment. Certain Settings control the synchronization of events, including History Filter settings. History Filters are available for select Event Sources. With History Filters you define rules that control the types of events the Monitoring Service writes into Event History concerning your monitored servers. If an event doesn't meet the criteria you've defined in the History Filter, information about that event isn't written to your SentryOne database. All Source Settings have a direct correlation to Conditions being met, because an event must first be captured before any Condition related to it can be evaluated. Note: These Settings include various Collection Settings. Settings are hierarchical, and work through the principle of inheritance, meaning that Settings applied at the Global level (All Targets) are automatically inherited by all the sites, target groups, targets, instances, and objects in your environment. Note: Generally it's a good idea to first configure your Settings globally, and then adjust individual Settings as needed at the lower levels. Select the desired node where you want to configure settings in the Navigator pane (View > Navigator > desired node). For instance, select the All Targets node if you want to configure Settings Globally, or select an individual instance node if you'd like to configure Settings specific to just that instance. Select View > Settings to open the Settings pane for your desired node. Select the Settings you'd like to configure from the drop-down list in the Settings pane. Within the Settings pane, directly beneath the drop-down lists, the full path of each Settings group is displayed. This path contains all of the ancestor objects for the selected Setting. Each Setting also has an Inherit From Parent flag that specifies if the Setting is being inherited. When this flag is set to true the name of the ancestor object that's passing down the inherited Settings is listed. For example, if you initially configure your Settings globally, as you get to the target and instance level, you'll see that each child Setting contains an Inherit From Parent (Global) listing, with the flag set to True. This lets you know that these Settings are being inherited from the Global level (All Targets). 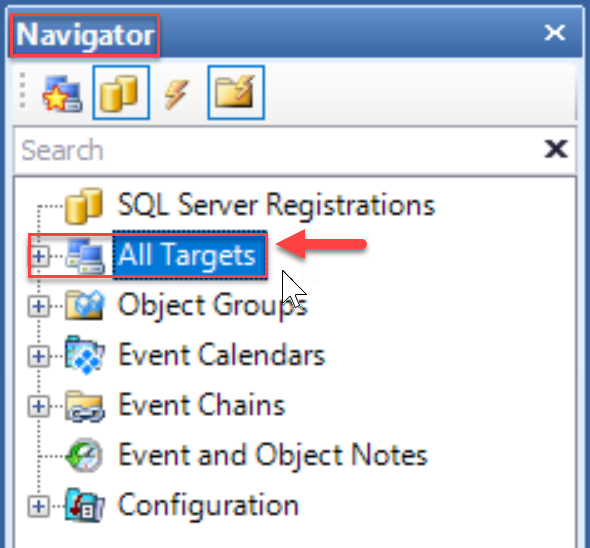 Select the All Targets node in the Navigator pane. 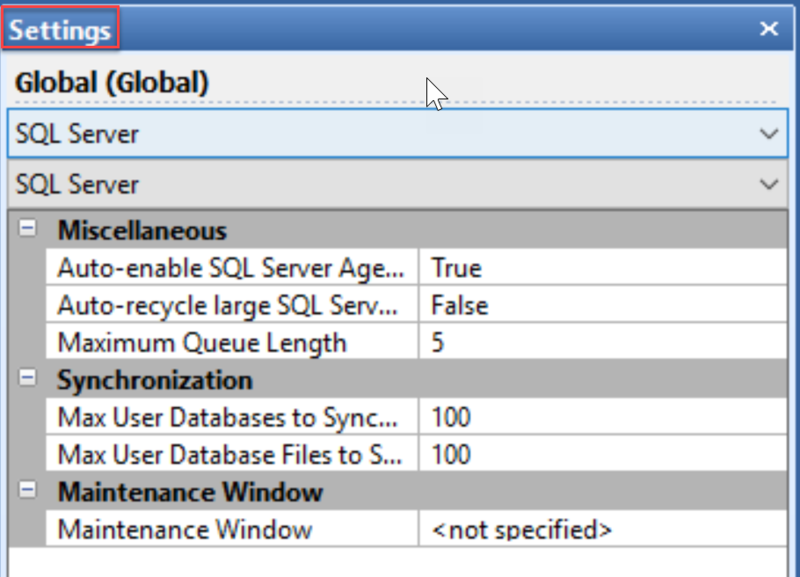 In the Settings pane, select SQL Server Settings from the first drop-down list. 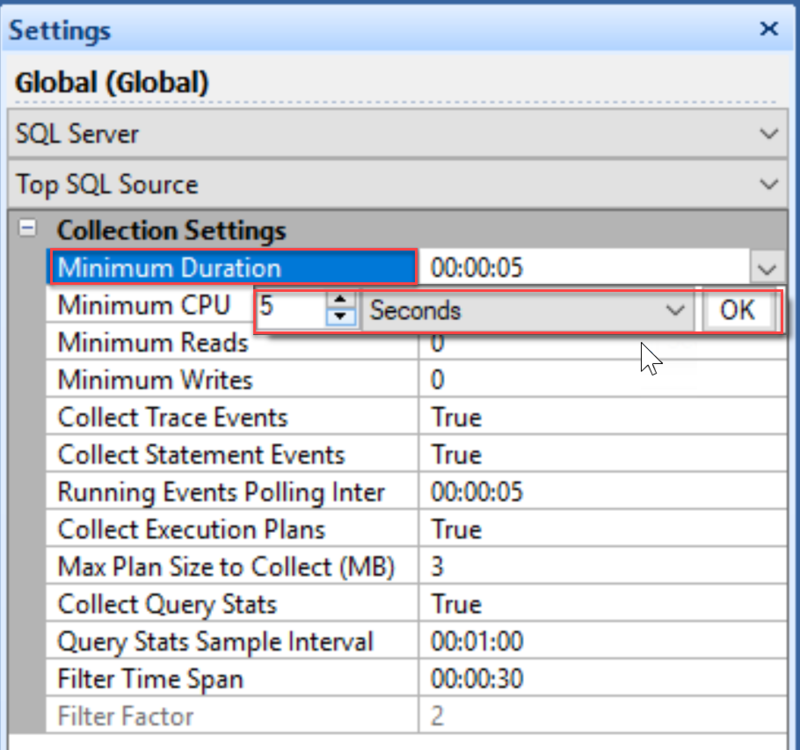 Select Top SQL Source from the second drop-down list. You should now see the Top SQL Source Settings that are being applied Globally. Change the Minimum Duration to the desired value, it's saved automatically. 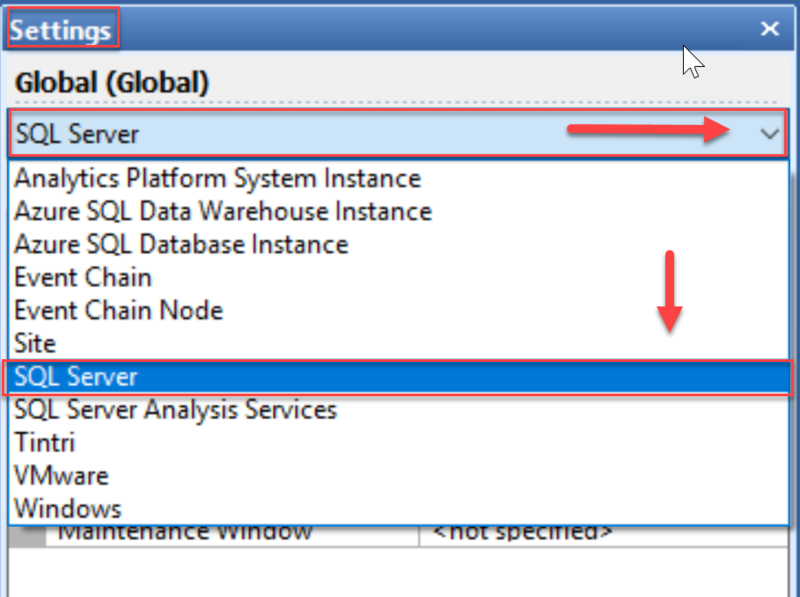 Select the desired instance node in the Navigator pane. 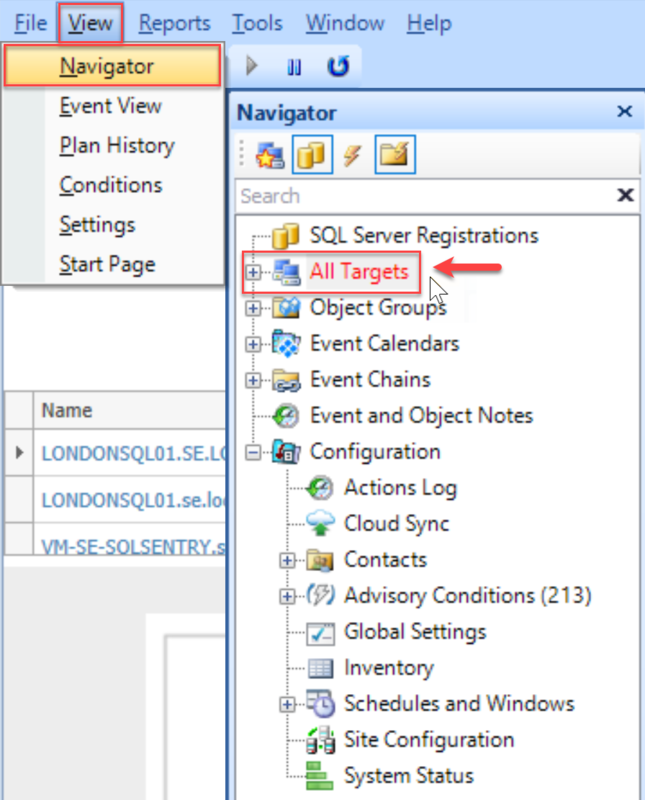 In the Settings pane, use the top drop-down list and select SQL Server Settings. 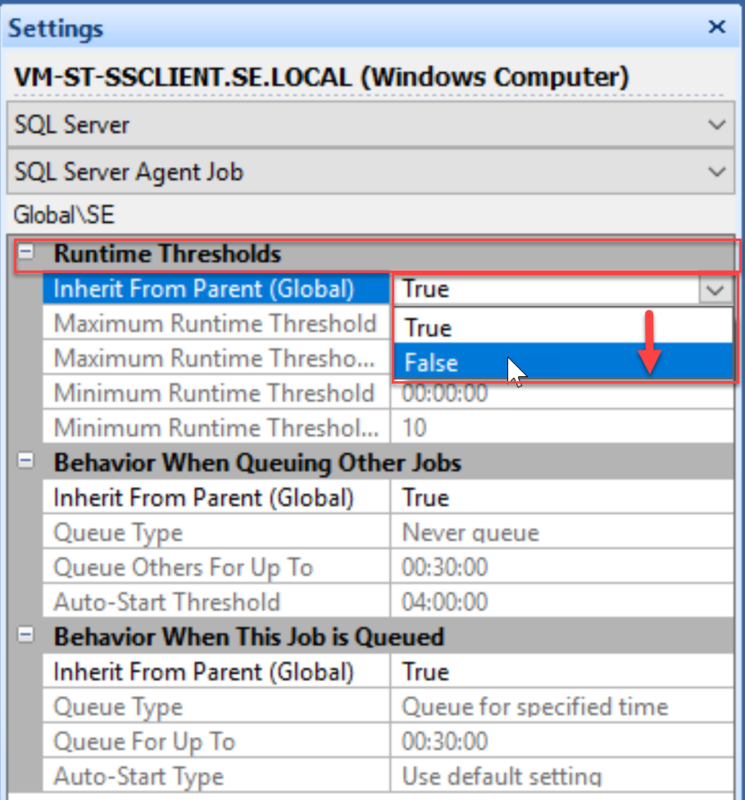 Use the second drop-down list to select SQL Server Agent Job. You should now see the SQL Server Agent Job Settings that are configured for the instance. In Runtime Thresholds change the Inherit From Parent Setting to False. Change the Maximum Runtime Threshold Percent to the desired value, it's saved automatically. Note: For information about Fragmentation Manager related settings, including database source settings, see the Fragmentation Manager topic. 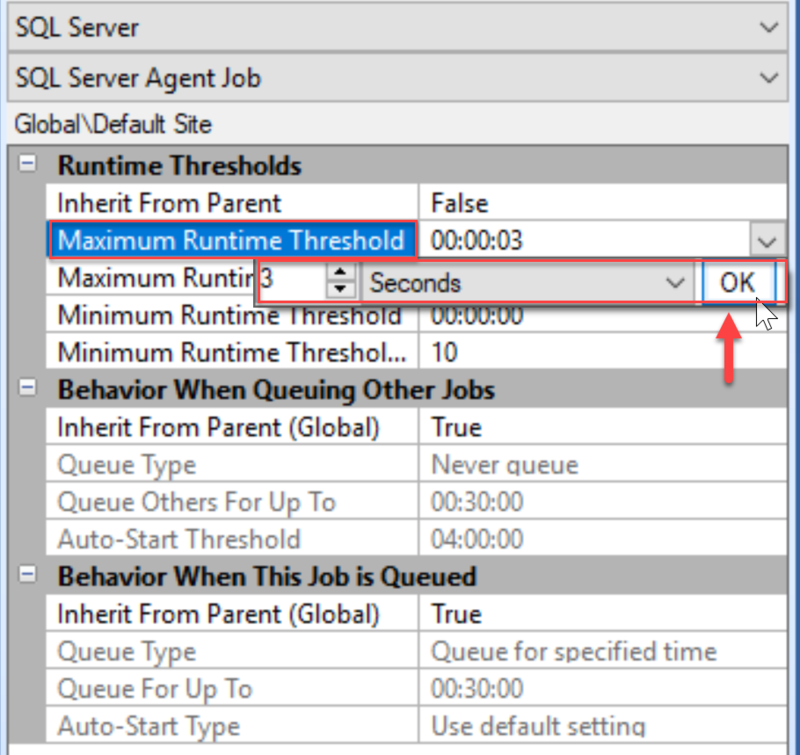 Runtime Thresholds can be set for a number of sources such as SQL Server Agent Jobs. A value for Minimum Runtime Threshold Percent and Maximum Runtime Threshold Percent can be specified. The global Minimum Threshold Percent default is 10 percent. The Maximum Threshold Percent default is 250 percent. Anytime a job runs for less than 10 percent or longer than 250 percent of its average runtime the associated condition is met and any actions configured for that condition take place. Note: If too many messages are being received, these settings can be adjusted as needed. Explicit time-based thresholds can be specified. Anytime an explicit time-based threshold is specified it overrides the percentage based thresholds for that object. Time-based thresholds are usually less valuable at the Global level, particularly the Minimum Runtime Threshold. Explicit runtime thresholds tend to be more applicable at the actual instance or object level for overriding the global percentage thresholds on a case-by-case basis. Note: One notification will be sent once the Maximum Runtime Threshold is met and a separate notification is sent once it's completed. For example, consider a job that has a great deal of volatility in runtime such as a transaction log backup, which can run for anywhere between 30 seconds and 30 minutes, and its average runtime is five minutes. To avoid unnecessary percentage-based threshold notifications for the job, one option is to set its Maximum Runtime Threshold to 35 Minutes and Minimum Runtime Threshold to 20 Seconds. This can be done by selecting either the job's node in the Navigator pane or an instance of the job on the Event calendar, then follow the same steps as above to access and change the job's runtime threshold settings. Note: Runtime Threshold messages for Reporting Services Reports completing in less than two minutes aren't processed until they are complete. Used to set the minimum and maximum values for the counter thresholds of that particular counter. These trigger the Performance Counter: Threshold Min and Max conditions if any actions are enabled for them. 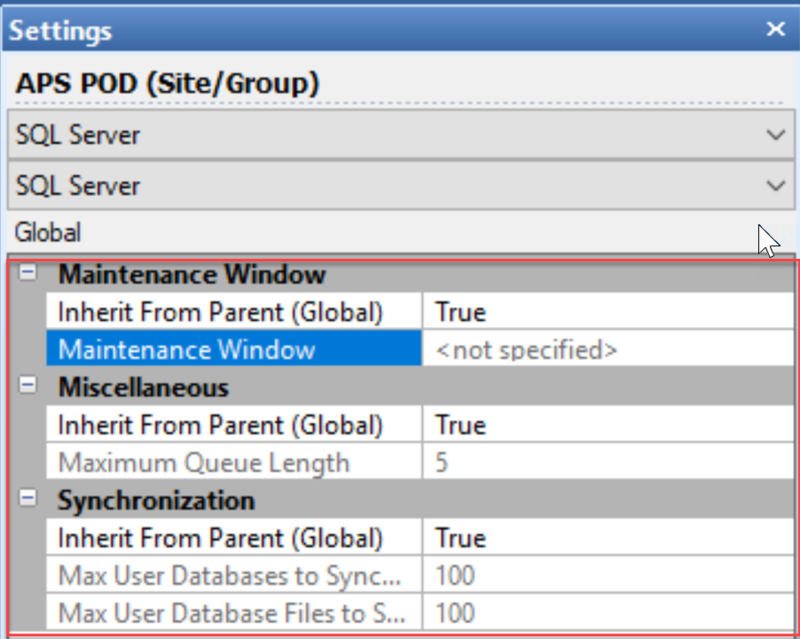 This option is only available when selecting a specific performance counter from the Navigator Pane. Note: There can be only one minimum and one maximum value for a given counter, regardless of how many objects are linked to the counter. For more information about Performance Counters, see the Performance Counter topic. Used to set a schedule for the Maintenance Window. Only Log Actions trigger for Failsafe conditions inside the Maintenance Window. Maintenance Window setting allow a time frame to be specified while daily maintenance activities take place on that instance. 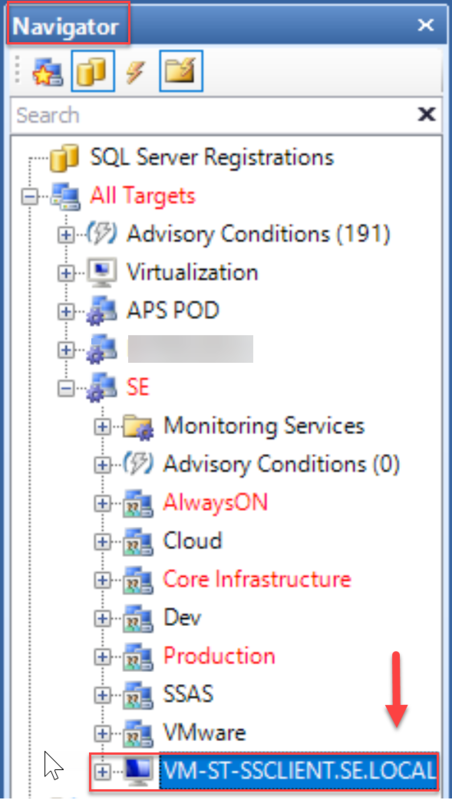 Locate the files for configuring SNMP MIBs in the SentryOne application folder C:\Program Files\SentryOne\18.0\SNMP MIBs.